Case report; Evidence; Scholarship; CARE guidelines. The case report is a staple of chiropractic literature; however, its value has been demeaned through inference by both a national regulator and a North American chiropractic researcher. 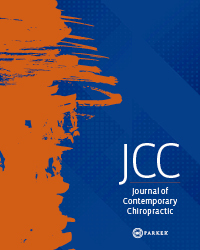 This paper describes the necessary inclusions to elevate the straightforward biomedical case report prescribed by the CARE guidelines to a level of validity that allows admission as credible evidence for chiropractic practice. We endorse the CARE guidelines for standard use throughout the chiropractic profession and explain how the philosophical tenets of aboutness and consilience can be applied with hermeneutics and axiology to benefit the heuristics of clinical decision making. The additional elements essential to a credible chiropractic case report are described in detail and a chiropractic-specific lexicon is given to enrich its evidential value in the absence of clinical trials. These include a complete description of the patient demographic and clinical presentation, a full description of the clinical entity identified by the chiropractor as the target for clinical intervention, a full description of the intervention applied, and documentation of outcomes measures. The consistent use by authors of more precise language within case reports of patient presentations associated with subluxation facilitates ‘aboutness’ to allow consilience of more than 1 case report of similar presentations. These simple techniques will produce a stronger level of empiric evidence in chiropractic. An application of the philosophical tools of aboutness and consilience is shown to allow agglomeration of multiple reports and then interpretation with hermeneutics. The phenomenological approach to preparing a prospective case report adds value by reporting the meaning of the encounter through the patient’s eyes, interpreted through axiology. A credible case report is admissible at a high level in any evidential hierarchy appropriate to chiropractic. The ‘Monday morning’ utility test is favorable for case reports. 4. Guyatt G, Sackett DL, Sinclair JC, Hayward J. Cook DJ, et al. Users' Guides to the Medical Literature: IX. A method for grading health care recommendations. J Am Med Assoc 1995;274(22):1800-04. 40. Seixas NS. Protecting our science. Ann Occup Hyg 2013;57(8):963-5 DOI: 10.1093/annhyg/met056. 81. Riley DS, Barber MS, Kienle GS, AronsonJK, von Schoen-Angerer T, et al. CARE guidelines for case reports: explanation and elaboration document. J Clin Epidemiol 2017 pii: S0895-4356(17)30037-9. DOI: 10.1016/j.jclinepi.2017.04.026. 120. Burcon MT. Upper cervical specific pattern analysis utilizing paraspinal thermography, leg length inequality and heart rate variability in two patients with tachycardia [Case report]. J Upper Cervical Chiropr Res 2016;(1):6-12 https://uppercervicalsubluxation.sharepoint.com/Pages/2016_1417_hrvtachycardia.aspx. 146. Hartman RS. Freedom to Live: The Robert Hartman Story. Ellis Ar. Ed. Amsterdam: Rodolpi Press. 1994.